Over the last few years, piezocomposite materials have enabled a new ultrasound probe technology to be developed for the Non-Destructive Testing of materials: Phased Array probes. These probes, made up of a large number of simple probes organized in linear, annular, circular or matrix arrays, allow electronic scanning, focusing and deflection to be carried out. These different concepts will be presented, as well as their associated benefits in terms of performance, flexibility, speed and feasibility of certain inspections. Different applications that have implemented this technology will also be presented, with details about the particular probes used. Through these applications, the benefits of phased array technology for many fields will be highlighted, including the nuclear, aeronautical and in-line testing industries. A certain number of industries requiring advanced means of Non-Destructive Testing, such as the nuclear, aeronautic or in-line testing industries, constantly seek improvements in the performance of their monitoring systems. The most common requests concern an increase in productivity, reduction in the size of untested areas and improvements in detection and sizing performance. For the last ten years, Imasonic has responded to these needs by designing and developing transducers based on Phased Array technology. The Phased Array concept is based on the use of transducers made up of individual elements that can each be independently driven. These probes are connected to specially-adapted drive units enabling independent, simultaneous emission and reception along each channel. These units should also be able to effect, during both emission and reception, the different electronic time delays for each channel. For some applications implementing electronic scanning, not all the elements of the probe are used simultaneously. In this case, the drive unit uses dynamic multiplexing to distribute the active elements among the elements of the transducer. Electronic scanning, illustrated in figure 6, consists of moving a beam in space by activating different active apertures in turn, each one made up of several elements of a phased array probe. It allows a mechanical scanning axis to be replaced electronically. In general, this concept is used for in-line testing of plates, bars or tubes, and can also be used for inspecting welds. Electronic focusing, shown in figure 7, is based on the use of electronic delays applied during emission and reception along each of the channels of the probe. These delays have an effect similar to that of a focusing lens and enables focusing to different depths. Electronic focusing allows only one phased array probe to be used where several single-element probes with different focal distances would be necessary. The most common applications are heavy plates inspection. Electronic deflection, illustrated in figure 8, uses delay laws for electronic focusing. In this case, they are calculated to give the emitted beam an angle of incidence which can be varied simply by modifying the delay law (all the delays applied to each of the concerned channels). Electronic scanning, focusing and deflection can be combined to resolve applications such as the inspection of welds or tubes. Examples will be dealt with in the paragraph "Examples of applications" below. Fig 6: Diagrammatic view of electronic scanning: groups of elements are successively activated to move the beam along the transducer. Fig 7: Diagrammatic view of electronic focusing: electronic delay laws are applied (left) to focus the beam. Fig 8: Diagrammatic view of electronic deflection: electronic delay laws are applied (left) to deflect the beam. Elements must be able to be driven individually and independently, without generating vibration in nearby elements due to acoustic or electrical coupling. The performance of every element must be as close as possible in order to ensure the construction of a homogeneous beam. Imasonic, thanks to its Piezocomposite 1-3 technology (1) and to its multi-element probe construction technology, designs and manufactures probes that meet these two criteria (2). Figure 2 shows the different possible geometries of the multi-element probes described below. These probes are made up of a set of elements juxtaposed and aligned along an axis. They enable a beam to be moved, focused, and deflected along a plane. Annular array probes are made up of a set of concentric rings. They allow the beam to be focused to different depths along an axis. The surface of the rings is in most cases constant, which implies a different width for each ring. These probes are made up of a set of elements arranged in a circle. These elements can be directed either towards the interior, or towards the exterior, or along the axis of symmetry of the circle. In the latter case, a mirror is generally used to give the beam the required angle of incidence (see figures 3 and 4). 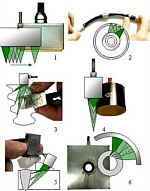 Fig 3: Principle of tube inspection from the outside with a 10MHz 128-element flat circular array and a mirror. Fig 4: Principle of a tube inspection from the inside with a 10MHz 128-element flat circular array and a mirror. These probes have an active area divided in two dimensions in different elements. This division can, for example, be in the form of a checkerboard, or sectored rings. These probes allow the ultrasonic beam to be driven in 3D by combining electronic focusing and deflection. Beyond their geometry, Phased Array probes offer the same flexibility of use as single-element probes. They can be used in immersion or in contact, their active area can be flat or focused, and they can also take into account the strong constraints of the industrial environment, such as temperature, pressure, vibration and radiation. This inspection, carried out using various miniaturized phased array probes, one of which is shown in figure 1.3, has enabled many previously untested areas to be inspected. The use of phased array technology has enabled the use of beam-deflecting wedges to be avoided, and thus inspections to be carried out from restricted spaces inaccessible with other techniques. In addition, the probes electroacoustic performances have enabled the depth of detection and the accuracy of sizing to be increased (3). Inspection of blade roots using 10MHz 32-channel linear array contact transducers implementing electronic focusing and deflection. Inspection of heavy forgings using a 5MHz 16- channel annular array implementing electronic focusing. Inspection of welds with a 5MHz 32-channel linear array implementing electronic focusing and deflection. In-line tube inspection from the outside with a 10MHz 256-channel circular array combining electronic scanning, focusing and deflection. Several phased array techniques can be used for inspecting tubes. In-line testing of tubes is generally done from the outside with encircling probes, as illustrated in figure 1.4. Inspection of heat exchanger tubes is generally done from the inside for reasons of accessibility. The generator tubes of the Superphnix nuclear power plant were inspected from the inside using the phased array circular probes illustrated in figures 1.2 and 8. Here, phased array technology enabled the required testing speed to be achieved. In addition, the active area, made up of 80 elements, was focused by shaping to obtain the required beam characteristics (4). This inspection can also be carried out from the inside and from the outside by using a flat circular array associated with a mirror, as illustrated in figures 3 and 4. Fig 5: FERMAT matrix probe for inspecting titanium billets using the time reversal mirror technique (M.Fink ESPCI). Titanium billets are traditionally inspected with sets of single-element probes, where each probe is dedicated to the inspection of a specific zone (depth range), for a specific diameter of billet. Although efficient in detecting defects, this solution has the major disadvantage of requiring many probes, and several shots to inspect a single billet. An alternative consists in using a matrix array. The cutting of the elements, such as shown in figure 5, and the electronic focusing and deflection enable the probes to be adapted to different diameters of billets and to different working depths. electronic deflection allows the angles of incidence to be varied with only one probe. Costs are thus significantly reduced because of the inspection and adjustment time saved. In addition, phased array technology has made some applications possible that could not be resolved by traditional solutions, for example, when beam deflection is necessary without enough space to use a wedge (rotor steeple and blade root inspection) or when scanning is necessary without enough space for the corresponding mechanics (inspection of bent small-diameter tubes from the inside).